I am totally newbie in this MSX world, and although I know well about computers and tech, I am quite lost here. I am very interested in acquiring one of this machines, but I really cannot decide which one should I really get, so I need a bit of guidance from experienced MSX'ers. 2) My main purpose will be programming (I used to work as programmer using VB6, C++ and also a bit of Basic back in the 80s.) Also I want to teach my wife computer programming, so It must be "user friendly". But it doesn't need any special GUI or graphical environment (like that kind of window system I saw somewhere). 3) I want something fairly reliable, that is not prone to internal hardware failure, such as leaking/exploding capacitors. Or, if this is inevitable, I want it to be easy to repair. I know basic soldering, but I totally lack the time to do this kind of things or even searching for replacement parts. If possible, with the least moving mechanical, so without internal floppy drive is ok.
4) I don't need a beast that can run the most hardware demanding demos or games, but at least some of the most significant games. 5) My gaming will be mostly basic RPGs, shooting games, some arcades, and so on. I am not so much into gaming per-se, but more about exploring the technology and experimenting with it (at software level), as well as enjoying programing with my wife. 6) Being able to connect it to a modern-ish TV (~15 years old Sharp Aquos LC-32GD7) Maybe through RGB? I would like to avoid signal converters and cables as much as possible. TV Specs http://gizport.jp/manual/26787/?id=40929 . Connectivity specs in page 9. 7) I want to use mostly cassette. Floppy disk would be ok too if it is external, although I don't have any USB floppy drive to connect to PC, and I want to avoid spending money on extra accessories. 8) About accessories, I don't discard them now, but could be welcomew in the future. 9) Some "modability" would be ok, but not necessary in the beginning. Ok if I can increase RAM, and if I can do that without soldering, even better, but not necessary. I would like an acceptable amount of RAM. Since I will casually work with the MSX, I don't need hundreds of KBs. Maybe 64KBs (total) is ok? Finally, I don't want to spend a lot on it. At very most 100USD. Also, I live in Japan, so I don't need any AC voltage converter, nor any specific TV adaptor (my TV is already japanese). Or any other shop around Tokyo~Kawasaki~Yokohama area, at a reasonable price. eBay? hx-10 isn't known for its known for the most reliable MSX. Sony, Panasonic, Sanyo, Pioneer..Living in the home land of MSX you should have a lot of options. I think MSX are really dependable, looking at other systems (c64) from those age. Not sure why people still want to use cassette. A good .wav recorder (not mp3) on the cassette port is much more dependable or just the analog output/input from a laptop and cassette to wave converter. Maybe a Panasonic FS-A1 is something for you? As you live in Japan, you can try the Yahoo action site or try the Beep Shop etc in akihabara? First choice you have to make: MSX1 or MSX2? Without MSX2 you will miss some very interesting games. Although 130 eur without the case, so over the budget. But you may find cheaper ones second hand, Zemmix or something. FPGA clones typically have VGA-output, SD card slot, SCC etc built in, so connectivity is good and external expansions are not required. But if it must be a real genuine MSX... well I think you'll find a good deal right there in Japan. About the programming: The BASIC is right there of course, but if you want C, you'll need a compiler. At least one exists that works in MSX but a disk interface of some kind is required, you cannot use that compiler with only cassette tape storage. And it's plain C, no C++. I'm nowhere near Japan, but I believe you should find a nice computer with that budget. I'd aim at an MSX2, since you are new to the hardware, your needs might change / sophisticate in the future and you might notice that MSX1 is not quite up to what you want to do. But I'm presuming you can get an MSX2 within your budget. If they have come prohibitively expensive there, too, then go with an MSX1. 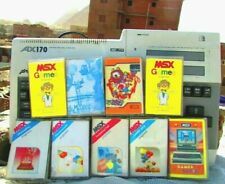 EDIT: About MSX computer generation options: Many important games require an MSX2, but there are many classics for the MSX1 too. MSX2+ might not be worth the money, but if you can get a good deal, then why not.... I believe Turbo-R is out of the question price-wise (and to be honest, the advanced features might go to waste while beginning programming on an MSX ... but if you really get sucked into MSX, you can always get one later - provided you can find one ). EDIT2: As mentioned by zPasi, The SX-1 or some OCM is certainly a good option - if you can get a good deal and it fits in your budget. It includes SD-card mass media, too! Bear in mind that using the cassette interface will get quite tiresome quite fast. I believe it is also impossible to do anything else than BASIC programming without at least a disk interface, if you want to use any language more advanced. So I'd recommend getting an MSX2 with an integrated disk drive, or a separate one. But of course, if you just want to try it out using the cassette interface is certainly feasible for BASIC programming, and you can always get some mass media afterwards - these machines are expandable! External floppy drives might be kind of collectibles (=expensive) these days and reliable new floppies might also be a rarity, so check out various SD-card / compactflash / IDE cartridges out there. @Wlcracks: Yes, I have here in Japan many options, but I'm quite lost on what could be the most appropriate model for my needs. About cassette, as you mention, a wav recorder or something that allows better flexibility is really welcome of course. The term "cassette" that I said was like a way of saying. @lintweaker: Thank you for your suggestion. I will take a look at the Panasonic FS-A1. @Manuel: I think MSX2 is the best choice. @zPasi: your suggestion sounds interesting, but I prefer to get my hands on a real MSX. @Wild_Penguin: Thank you for your instructive advice. I will be getting an MSX2 definitely. It seems more flexible, expandable and offering many more possibilities. About the floppy drive, yes, it is a nice addition. I will be programming BASIC exclusively. For games, I will buy cartridges, and for saving my programs, maybe cassette (wav recorder/android app) could be fair enough. But of course, FDD would be nice. Also one doubt I have now is, if I use a program or app such as MSX2Cas, will the program load faster than using a real cassette player? Then I would recommend an MSX2 with disk drive, which has good caps. Caps are not my expertise, though. Eventhough the Sony HB-F1XD is a great machine to look at, it's from a suicidal family. The XD, XDJ and FX have a lot of weak spots that will blow in time (and that time has started years ago, so we're in the middle of it). I'd avoid that model. Panasonic and National made some great sturdy machines. I've heard nothing but good reviews about them. Just be sure you get the power adapter with the Panasonic FS-A1. They're very unique and very rare. In a lot of cases their prices exceed the machine itself. So forget about it if there's no power adapter in the package.